There are so many beautiful reasons to celebrate and raise a glass with someone you love! 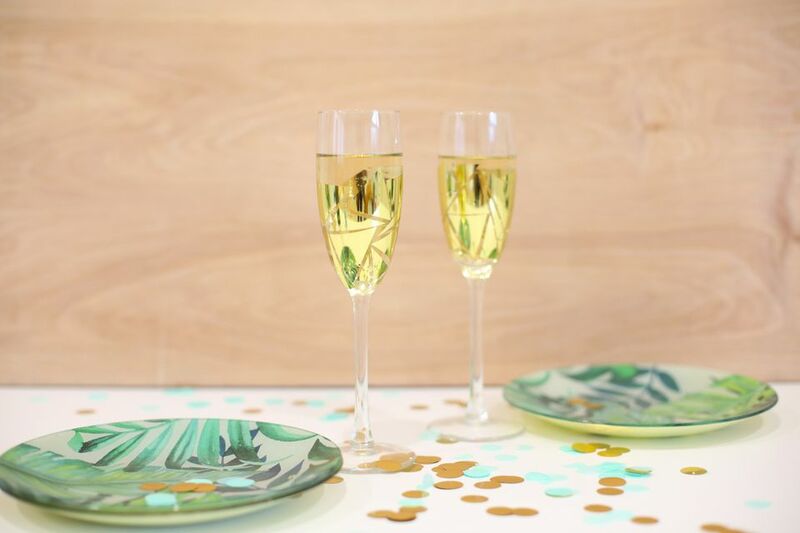 Whether it's Valentine's Day, a wedding, an anniversary or just a celebration with friends, these gold patterned champagne flutes are an extra special addition to any festive occasion. They're made with just three materials and come together quickly to create a final product that looks polished and extra fun. Get together with your friends to make a whole batch of them, or create them yourself as a surprise for a special someone. Either way, they're guaranteed to wow. There are lots of different types of vinyl that you could use to create these fun flutes; we chose a bright, reflective gold for a mirrored finish. Check out the adhesive vinyl section in your local craft store as you're making your selection. You could choose a signature color, a muted shade, another metallic or even something glittery. 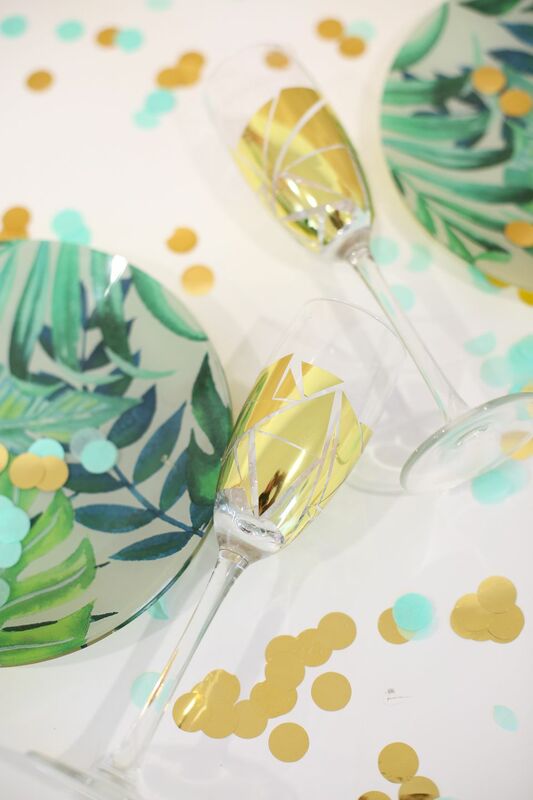 In thinking about what kind of pattern you'd like to create, keep in mind that certain shapes or sizes of vinyl will work better on a champagne glass. Because of the curved shape of the glass, you'll need to tailor the size of your pieces so that they don't ripple or bubble. We decided on a geometric triangle pattern. Start cutting pieces of your pattern from your adhesive vinyl, leaving the backing on the pieces. Depending on the size of your vinyl pieces, this can be a bit tricky. Use your nail to peel away the vinyl from the protective backing. Starting in the center of one side of your champagne flute, apply your first piece of vinyl. Continue applying pieces in your chosen pattern. As you apply each piece, smooth it down with your thumb to ensure there are no bubbles or rippling. If you find that you are having trouble with bubbling, try removing the piece and cutting a smaller piece. The larger pieces will have trouble wrapping around the curved surface of the glass to lay flat. Smaller pieces should adhere more smoothly. Once you have a start on your pattern, keep cutting pieces of vinyl to fill in the blank areas. You may need to cut custom pieces to fill in certain spots; keep an eye out for blank areas in the pattern and cut the vinyl that you'll need to complete those spaces. As you're finishing your pattern, we recommend leaving at least the top inch of your glasses free of vinyl, so that it's easier to drink from the glasses. Nobody wants to toast alone, so make another champagne flute and say cheers! After you finish your glasses of bubbly, just hand wash to keep the vinyl fresh.